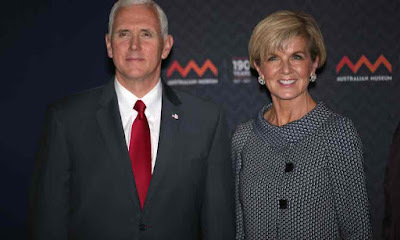 minister,Julie Bishop, after she said the rogue nation would be subject to further Australian sanctions and for “spouting a string of rubbish against the DPRK over its entirely just steps for self-defence”. She said the sanctions were to send “the clearest possible message to North Korea, that its behaviour will not be tolerated, that a nuclear-armedNorth Korea is not acceptable to our region”. Labor’s defence spokesman Richard Marles said on Sunday North Korea’s threat was of enormous concern but such threats had become part of the regime’s day-to-day rhetoric. Marles said Pyongyang had made similar threats to other nations, even a veiled one at China. But he did not believe conflict on the Korean peninsula was particularly likely and backed the approach the US had taken on North Korea. “I do think a harder edge being presented by America in respect of North Korea is not a bad thing,” he told Sky News on Sunday. He believed the early signs coming out of China, an ally of North Korea, were positive, it saying if the problem is going to be dealt with it needed to be through “China, America and the whole world”. He said Australia’s global economic interaction was in large measure in that precise part of the world with its main trading partners being China, Japan and South Korea. “So we have an enormous interest in a stable Korean peninsula and stability in that region,” he said. North Korea’s nuclear threat dominated talks on Saturday between the Australian prime minister, Malcolm Turnbull, and the US vice-president,Mike Pence, with Turnbull saying China had the leverage to influence North Korea.